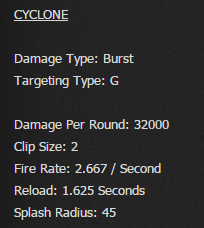 These are the Weapon Stats for the CYCLONE as given by WrongThinker in the Hidden Unit Stats: Revealed! thread. 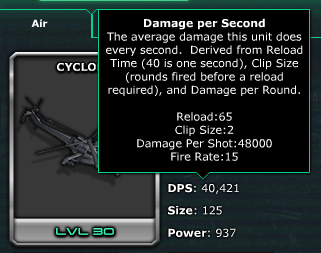 Ok, now we want to turn the whole number given for Reload and Fire Rate into a usable TIME.. I get the Reload Formula ( 65 div 40 = 1.625 ). That one is easy to see. But what about the 15 Fire Rate .... What Formula is used to turn 15 into 2.667 per Second. I might just be tired but its not coming to me off hand so I thought I would ask if there was a math guy out there who could tell me real quick.